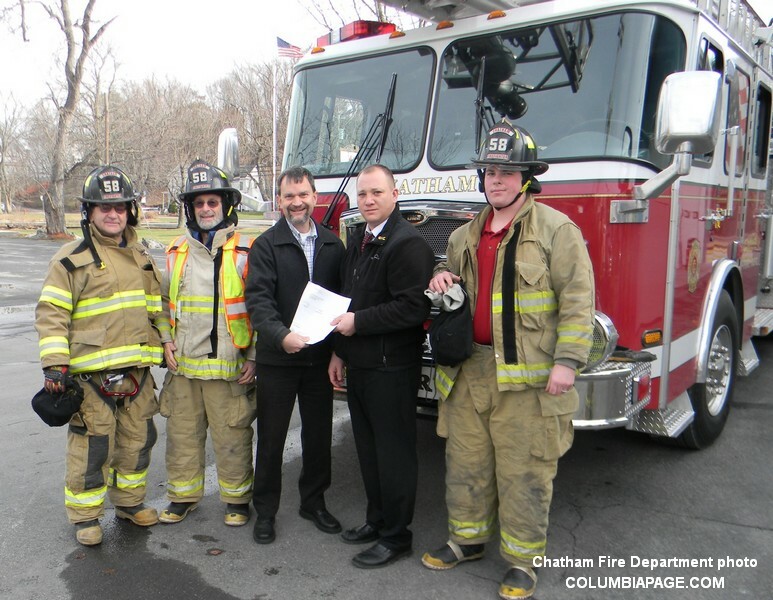 CHATHAM, N.Y.—The Chatham Fire Department has received a $2,095 fire prevention grant from FM Global, one of the world’s largest commercial property insurers. FM Global representatives presented the award to 2nd Assistant Chief Eric Barnes and volunteer firefighters at the Chatham Fire Department, Chatham NY. The award will be used to assist with pre-fire planning and technology upgrades to efficiently collect and track data related to local community buildings. The information will help the fire service respond in an emergency situation. Because fire continues to be the leading cause of property damage worldwide, during the past 35 years FM Global has contributed millions of dollars in fire prevention grants to fire service organizations around the globe. Locally, the company has awarded grants to a number of New York-based organizations. “I am proud of the Chatham Fire Department, and how everyone takes their job seriously. I rest easy, knowing that our community is protected by well-trained firefighters with good equipment,” said Thomas Curran, Mayor, Village of Chatham after learning of the grant. Through its Fire Prevention Grant Program, FM Global awards grants quarterly to fire departments—as well as national, state, regional, local and community organizations worldwide—that best demonstrate a need for funding, where dollars can have the most demonstrable impact on preventing fire, or mitigating the damage it can quickly cause. To learn more about FM Global’s Fire Prevention Grant Program, or to apply for a grant, please visit: www.fmglobal.com/grants. For nearly two centuries, many of the world’s largest organizations have turned to FM Global to develop cost-effective property insurance and engineering solutions to protect their business operations from fire, natural disasters and other types of property risk. With clients in more than 130 countries, FM Global ranks #557 among FORTUNE magazine’s largest companies in America and is rated A+ (Superior) by A.M. Best and AA (Very Strong) by Fitch Ratings. The company was named “World’s Best Supply Chain Risk Insurance Provider” in 2014 by Global Finance magazine and was voted “Best Commercial Property Insurer” in Business Insurance’s 2013 Buyers Choice Awards. L to R ~ Firefighter Patrick Wemit, Firefighter David Levow, FM Global Representative David E. Libby P.E., 2nd Asst. Chief Eric Barnes, and Firefighter Austin Haner.